First Nations of the Plains: Creative, Adaptable and Enduring documents the experiences of the Indigenous peoples of the plains after contact with the European invaders. This cultural clash literally turned the lives of the Aboriginal Peoples of this continent upside down. Always persistent, however, the First Peoples of the Plains have proven their mettle in a myriad of ways. Despite the atrocities committed against them, they have endured and today are increasing in population, economic development and political strength. 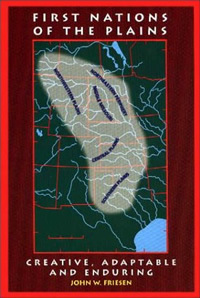 The remarkable story of the Plains First Nations includes physical and cultural genocide, insincere and broken promises, forced migrations, inflicted diseases, deliberate destruction of their major means of livelihood (the buffalo), hate campaigns, discrimination and miseducation. Despite this inhumane treatment, the First Nations of the Plains have survived and endured. This volume traces their miraculous story from the plains of Alberta and Saskatchewan in the north to Texas and Oklahoma in the south. This book provides an in-depth look at aboriginal people of the Plains after contact with Europeans. Cultural groups are examined from a geographical, historical, and cultural perspective. Highly recommended for students of aboriginal culture.